On February 2, they are set to perform at the Waterfront Hotel and Casino in Cebu City. On March 2, they will take center stage at the SMX Convention Center in Davao City. He may be the youngest but 17-year-old Darren is more than capable of holding his own in the company of veteran singers like the other Aces. Darren started singing at 2 and rose to fame in the Philippines after placing second in season one of The Voice Kids in 2014. His first album, Darren, debuted at No. 1 and has since been certified Double Platinum; his second album Be With Me also went to No. 1 and is now certified Platinum. Darren’s current single “Poison” is currently climbing the charts, and his third studio album will be released soon. Shortly after winning season one of GMA-7’s Pinoy Pop Superstar, Jona—who at the time was still going by her real name Jonalyn Viray—became an in-demand performer and recording artist. Jona’s first studio album On My Own turned Gold, and her self-titled second album yielded a hit single in “Help Me Get Over.” It went on to win Song of the Year at the 2014 PMPC Star Awards for Music. A year later, she made headlines when she transferred to the Kapamilya network and changed her stage name. She has released an album under ABS-CBN’s in-house record label Star Music, which was eventually certified Platinum. She has also filled concert venues here and abroad, both as a solo performer and as part of a group. The diva known as Asia’s Nightingale hardly needs an introduction. Lani’s career spans decades and includes an impressive stint performing in Las Vegas, where she became known as the Siren of the Strip. During her time there, Lani performed with the Society of Seven at Bally’s and the Flamingo, making her the first Asian to headline a main showroom on the Las Vegas Strip. All of Lani’s albums have been certified Gold or Platinum. Individually, Darren, Jona and Lani are phenomenal. Put them together in one show and what do you get? 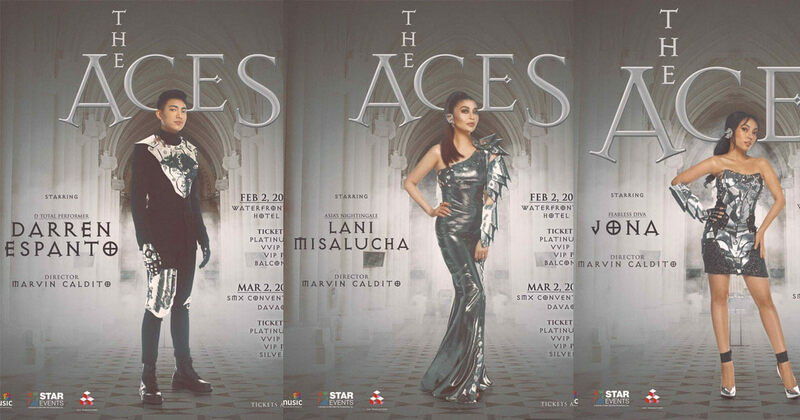 A concert that will highlight the very best of OPM, featuring four of its most excellent singers—the Aces.